Posts about my workbench build .. which has been a long process. Newest post at the top. Photos in order of completion. My original work bench was a weekend mdf topped workbench. I’ve converted it to a Roubo-like bench. Ding dong! The Workbench is done! – Click this link for the full story and most of the photos! Oh the bench is back!!! Yup, still workin’ on the work bench .. I hate having two big projects going at once .. Very nice. I would like to build one of these when I have the extra money to spend on lumber. In the mean time I was thinking about building a simple bench that would give me something to work on right now. It would also make building a Roubo workbench easier later as I would have something to work off of. Do you have any info on your mdf workbench? Pictures, plans, or a place where I could find info on building one? I use a Shop Notes plan that doesn’t seem to be available any longer. But you could go to that site and search for workbenches to see if any of the ones they have fit the bill. Also Chris Schwarz has a $ 175 workbench that you might like and easily modify as you have needs. 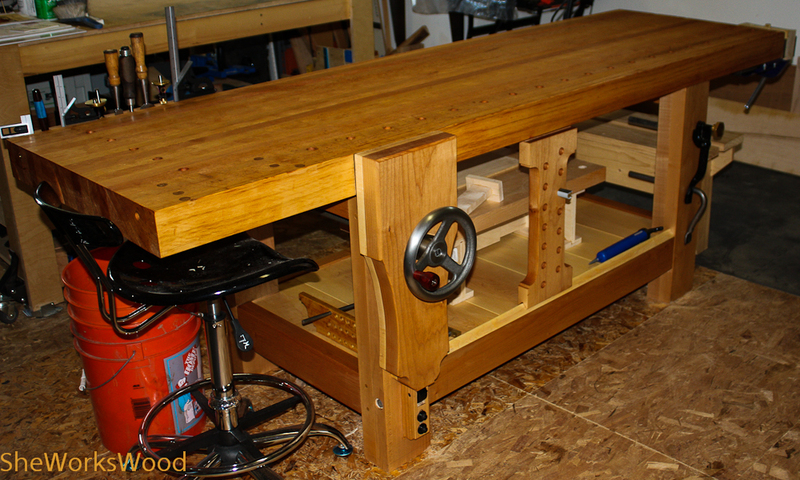 See his The Workbench: How to Design or Modify a Bench for Efficient Use. I have been wanting to build one of these benches for a long time now. I love the polished benchcraft hardware and it looks like cocobolo handles. A beautiful bench, great job! !